It has been a week since I stepped off the plane back in Ottawa, but last week ended up being the best vacation ever. In fact, the trip was better than I imagined a vacation could even be. 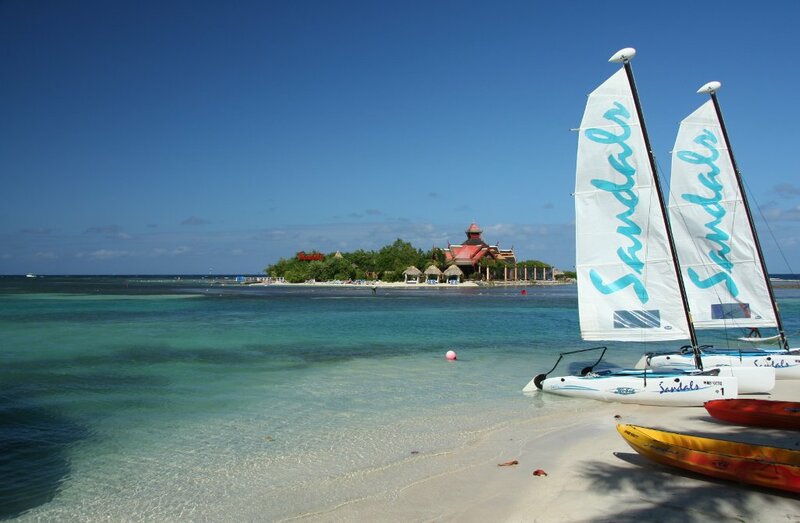 The setting for the vacation was Sandals Royal Caribbean, in Montego Bay, Jamaica. The service was all-inclusive, the staff was very friendly, and the food was exquisite. While the reason for being there was to celebrate a wedding, most of the time really was spent relaxing. I never thought that kicking back, enjoying the sun, hot tubs, and beaches could actually be this nice. Add a frosty beverage to the mix, and it was downright therapeutic. No vacation would be complete without some interesting achievement. This time around, I decided to learn to scuba dive. After some courses and tests, I'm now PADI Open Water certified. I never imagined it would be such an easy and peaceful thing to do; the heavy equipment, awkward fins, and constantly-fogging mask were sure to get in the way. But they did not. On the last day, I also took a hand at sailing a Hobie Cat sailboat. It was great, right up until the moment when I flipped it! Interesting fact: the island owned by the resort is Sandals Cay. However, until it was renamed in the 1980s, it was called Kokomo Island; the same one as in the Beach Boys song! Last time I was in Jamaica was right before I turned thirteen. We were staying at an all-inclusive Holiday Inn. I remember the food and service were not that great. However, I remember that when we went out on boat rides, we always went by a Sandals, and I thought to myself, "one day I will go to one of those and learn to scuba dive." Little did I know, the Sandals I had my eyes on was actually the place where we stayed, and where I learned to scuba! Of course, this realization on occurred after getting home and referring to photos from fifteen years ago. I have been toying with Gumstix and OpenEmbedded recently. It is certainly a fun hobby, and these increasingly-smaller devices are becoming more and more useful. I can think of up any number of uses for them with model boats as telemetry tools, or handheld devices; the possibilities seem endless. Having recently come in possession of an eight-core box, it is really impressive to watch OpenEmbedded compile a full image in record time, maxing out all of the cores. 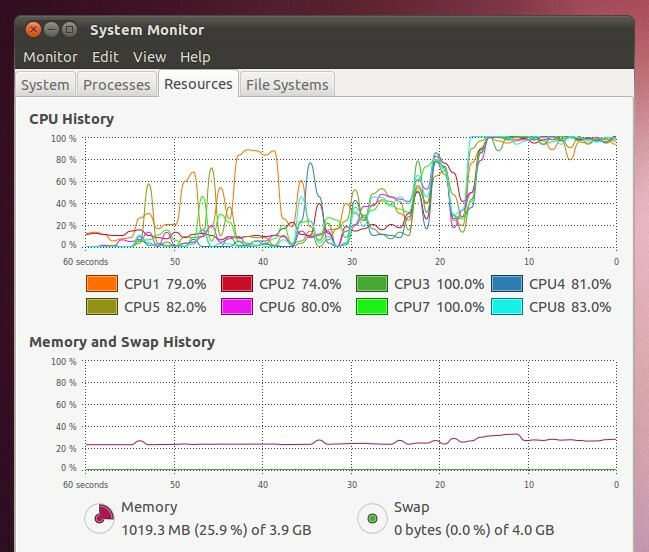 Lines in a CPU graph are a tangle of goodness. It is especially neat seeing the tangle of usage level out at the top when a large component starts building.